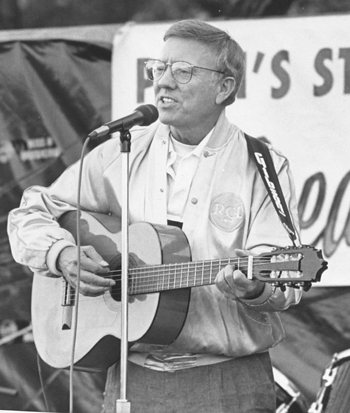 Billy Edd Wheeler is a West Virginia-born American troubadour, an important part of the Appalachian storytelling tradition. He’s written songs made famous by Johnny Cash, Kenny Rogers and Richie Havens, but songwriting is only part of the man’s impressive body of work. The latest from the pen of the prolific Wheeler – a pillar of the Western N.C. arts community and a longtime Swannanoa resident – is his memoir, Hotter Than a Pepper Sprout. Wheeler has recorded more than 15 albums himself, but is better known as a composer than as a performer. “I always thought I would be known as a songwriter,” he says. But that label is insufficient to describe Wheeler and his work. He has painted extensively, written books of poetry, composed the story and music for eight plays and musicals, and authored several outdoor dramas including Hatfields & McCoys. Wheeler received an advance payment of $10,000. “That was a lot of money back then,” he says with a laugh. He and Cornett did additional research, and wrote the musical drama. The play premiered in 1970 and ran for 45 years in Beckley, W.V. That achievement would be but one in a long list. Wheeler moved around a lot in his younger years, attending Warren Wilson College in his teens while spending summers variously in Detroit and his rural West Virginia mining hometown. And once he made it as a songwriter, he traveled extensively. But by the 1980s he settled in Swannanoa. “I had a little bit of stardom, but not much,” he explains with genuine humility. “I started getting tapes in the mail from people wanting me to criticize their songs.” But those budding songwriters expected Wheeler to critique for free, and even pay the return postage. “I thought, ‘This ain’t working,’” he says. So Wheeler established the Great Smokies Song Chase, hosted at his alma mater, Warren Wilson College. After a successful four-year run, Wheeler was ready to end the Song Chase. But WWC president Doug Orr wanted a good thing to continue, and so Wheeler stayed on one more year while the Great Smokies Song Chase evolved into a new event, the Swannanoa Gathering. Wheeler truly believes that the creative technique of songwriting can be taught. “Now, you have to have a kernel of talent to begin with,” he cautions, “but I don’t know anybody who didn’t benefit from good criticism.” He says that the schooling he got early on from Jerry Lieber and Mike Stoller (composers of “Hound Dog,” “Kansas City, “Young Blood,” Searchin’” “Jailhouse Rock” and nearly 70 other hits) was a key to his own success. He also got some early advice from Thornton Wilder, author of Our Town. “He said, ‘Billy, if you’re going to write, take time to ponder. It’s important. And by the way, if you ever decide to study play writing, I suggest Yale.’” Wheeler recalls looking at the famed playwright in astonishment. “He knew what I was thinking,” Wheeler says. “’Oh. They give scholarships, Billy.’ He knew I couldn’t afford Yale.” Wheeler would go on to earn a scholarship and study there. Today at age 85, Wheeler shows little sign of slowing down. 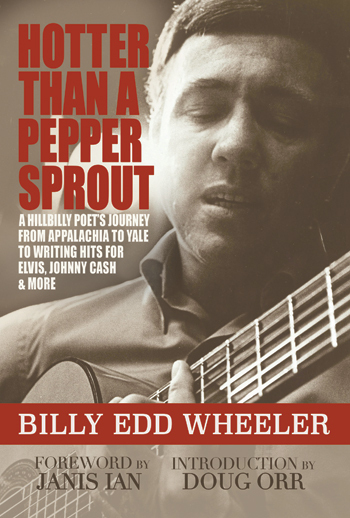 Hotter Than a Pepper Sprout is a highly enjoyable chronicle, following a young boy in Boone County, West Virginia through a fascinating lifetime, rubbing elbows with Elvis, Chet Atkins and countless other musical peers. And he’s not done yet. With co-writer Randy Poe, Wheeler is working on a sprawling Western novel. “I stole the plot from Captains Courageous,” he says with a chuckle, but then he goes on to describe a wonderfully original variation on Kipling’s 1897 work. Wheeler knows that he’s part of a long Scots-Irish Appalachian oral tradition, but admits he didn’t always know. “I really didn’t have any idea where I came from,” he says. But when, as a young boy, he was told that the folk songs he loved had come from England and Scotland, his eyes were opened. “I thought, ‘Wow. There’s a big part of the world out there that I don’t know anything about.’” He would spend the rest of his life learning.